Protecting the confidentiality of vital information is a key concern for many businesses and these concerns also apply to the documents that are printed. Kyocera network printers and MFPs address this concern by incorporating into the Kyocera KX Driver features such as Private Print. 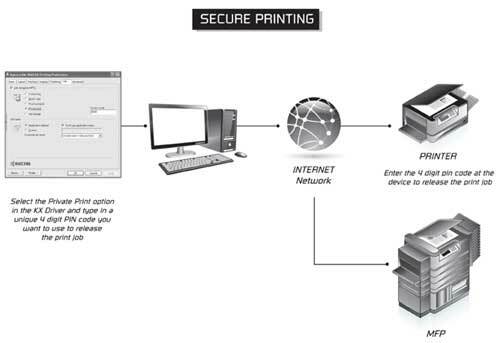 With Private Print users can securely print documents on any shared Kyocera printer or MFP from their PC and release the print job at the device by entering a personal identification codes (PIN) ensuring that the print jobs remain private.